In situations where the damage from “wear and tear” in the knee is only on the inner part of the knee (or medial side), the knee often develops some deformity with a “bow-legged” type appearance. Sometimes this can be subtle; in other cases it is very obvious. It is not a new technique for orthopaedic surgeons to attempt to “straighten” the leg (or even sometimes to “over-straighten” the leg) to “off-load the damaged part of the knee. This places extra load on the other “undamaged” outer side of the knee. In all operations it is crucial to ensure that the “other” compartment to which the weight is being transferred, is sound. This is normally confirmed with a keyhole assessment prior to the osteotomy at the same anaesthetic. What is new, are the devices that are now available to measure the correction of the re-alignment and to hold the realigned bone in the correct position until it heals. This allows more accurate surgery and earlier walking after surgery. 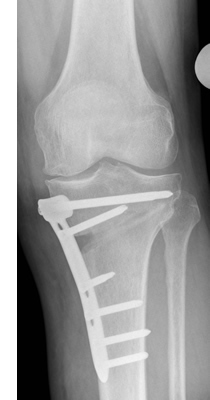 During the procedure the tibia bone is carefully cut on one side under x-ray guidance. The cut side (on the inner border of the tibia) is then wedged open. This corrects the position of the leg and allows the “weight-bearing” axis of the knee to be moved towards the middle of the knee, or in some cases slightly beyond. When the gap has been opened sufficiently a plate is applied and used to secure the corrected position. The defect in the bone gradually fills in with new bone over a period of some months. Usually walking is allowed from 3 weeks. 9) Most patients that undergo realignment osteotomy will still have pain in their knee, though for over 80% it is drastically reduced in comparison to the pain that they were getting before the procedure. The main benefit of the procedure is that it allows a significant reduction in arthritis pain without the need for a replacement of the knee. This makes it a particularly good option for younger, more active patients. However, it is a significant procedure to go through and takes some time to fully recover. For most patients it achieves a delay to knee replacement of many years.